- Inner Frame - 3 different "T3F" inner frame options are available that can accommodate a combination of up to 4 power sockets, 6 cable pass−through or connector inserts, 1 long insert and up to 3 Kramer TOOLS. Table Top Box is used to hide away cables and multiple connection of video & audio is used and clean installation is required of cabling. 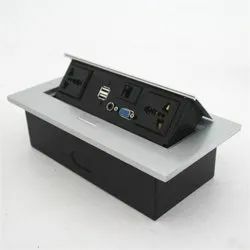 The Connectors on the table top box features coupler based connection to easily connect laptop, tablets and any other sources with the outputs. Popup box is used to connect projector. - Manual Push to Pop up Box. - VGA, Audio, HDMI, 2xLAN Connectors. - 2x Un-switched Ac power 110v-240v 50/60 Hz, 10A Outlet. - Top Panel Size:266x130mm- Table Cutting Size:224x110mm.